I recently sat down with Esquire to share my ten most grail-worthy timepieces. Like my own personal collection, it’s a mixed bag of modern must-haves like the ceramic Daytona ref. 116500, and the current Explorer II ref. 216570. Vintage classics like the Triple Calendar Moonphase ref. 8171 and the Submariner ref. 6200 with the Explorer dial have made it to the list as well. Esquire has featured Bobs Watches on their site. In addition to the list, a Paul Newman, a President, and a GMT-Master Pepsi make an appearance too. There’s even another brand in there other than Rolex—can you guess which one? 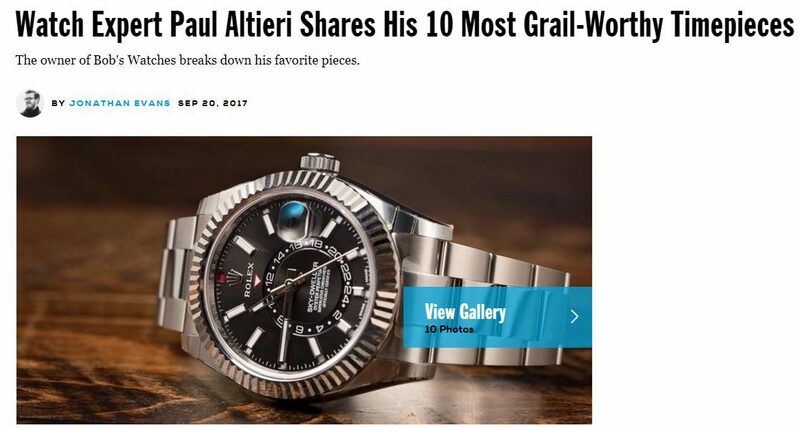 Check out the article on the website, scroll through the gallery of pictures, and find out why these ten watches are some of my favorites, ever. What ten pieces would you include in your perfect luxury watch collection? Share your top ten picks with us in the comment section below!